The red arrows show groove recesses for Teflon strips on this 1.5" RA shaft. The Teflon will be adhered to the shaft and will thus rotate with the shaft in the RA housing. Here is the RA housing. I'll remove the overspray first. I then have a variety of options to finish the inside bore that the Teflon will ride against. Shown are a few of the stones that I could do a very light hone with. I'm fairly good with honing and can control the cross hatch. I can also make sanding flappers with a rod and strips of sandpaper. I have buffing wheels to knock down the frosted finish of honing or sanding, if desired. I know a polished surface is not ideal. I'm fairly open to options of the best finish for the RA housing bore in terms of home shop. I'm not interested in sending this out for elaborate coating surfaces. The idea is to put in a good contact surface, home style. The Teflon will not take a 'set' during storage as that will be done in a flipped position. I'm not expecting much of a textured finish that would cause a 'set' concern, but a meridian flip storage is cleaner for a primary. I don't know if there is a preferred finish or if discussion of such exist for this situation. I had no luck in research. Lacking any input, I'll remove the grey overspray, fine hone with a close angle cross hatch (fast strokes) which make the hone marks more in line with the shaft and perpendicular to the direction of rotation, then buff lightly to barely reduce the frost (knock tips off the honing ridges). This is just a gut feeling approach. The clearance between Teflon to bore surface is set at ZERO clearance. Honing would be to just show uniformity, then buff. Picture shows the Teflon strips. These are 1/32" thick strips. This is all original factory configuration. 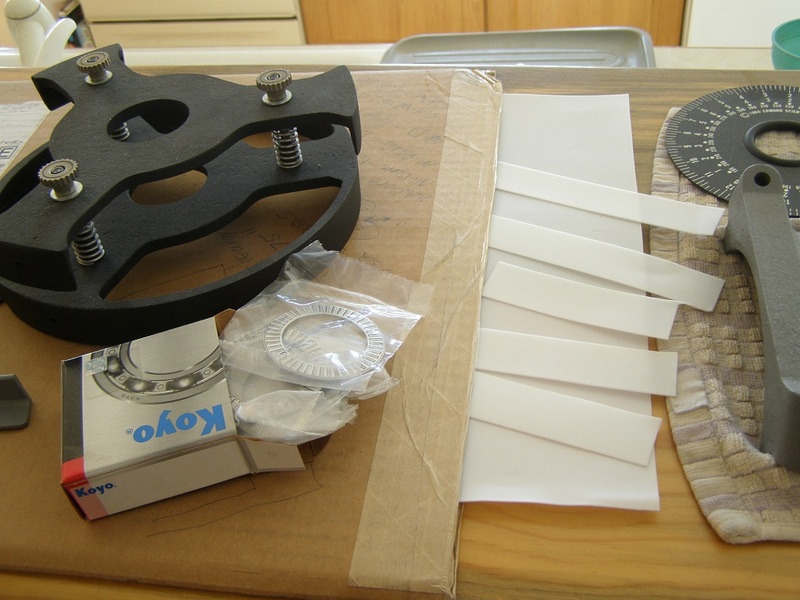 I'll be using the roller thrust bearings in place of the original Teflon washers. The bearings were also a factory original item in the earlier units. This is not a HUGE factor. I'm just shooting for as much a magnetic suspension feel as possible while I'm at this stage, if there is a known finish preference. Here is the how the DEC shaft aligns with the Dec housing. This is direct metal to metal. 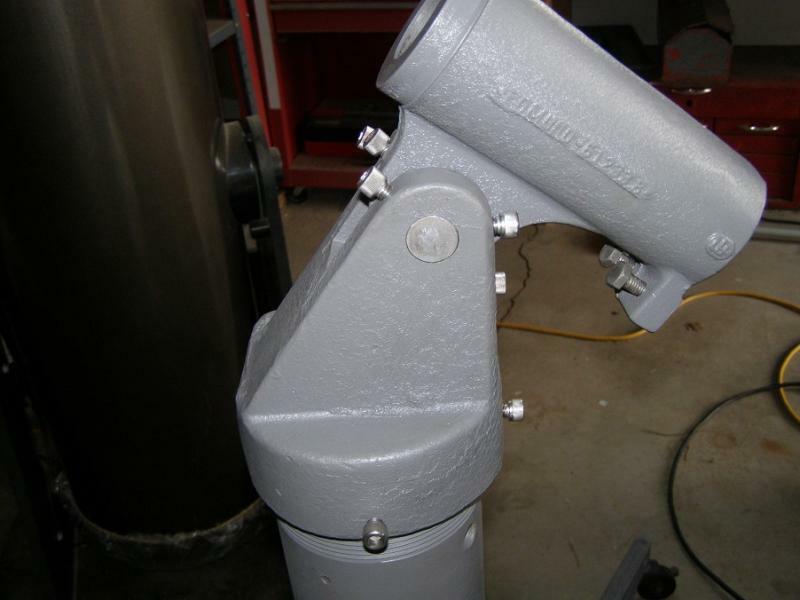 The worn spot at the top of the shaft is due to the clamping brake, but the wear is only in the plating with random spots of plating still remaining through out. I'll have this aligned better. As can be seen, the nickel plating is full present at the contact area with the housing. This is also the situation hidden under the overspray at the bottom contact area (actually the overspray is the TOP contact area in use, where the saddle would be up). This vintage mount is in excellent condition, and will stay that way as long as I have it. Total clearance between shaft and bore is 0.006" which would be 0.003" if evenly distributed by some wrap. I'm not so sure Teflon would be structurally sound in this thickness. There is a thick Teflon tape for pipe fittings that I will check on specs. I think regular Teflon tape would ball up and tend to bind, even get lopsided and press the shaft and housing tighter directly. I'd like to keep this a dry fitting for dust purposes. Graphite can stack and bind as well. My initial thought is a 'dry' Teflon lube that typically uses a remaining wax base after dry, which would be better than grease for creeping and dust. I wouldn't mind tightening up the clearance a little, while I'm at this stage, but not a huge deal.....yet. I may not like the slop in use if I don't get some medium in there. Nice. Brass shim stock at .002". Any Teflon tape applied would have an end edge, no? edited thickness for radial clearance. Edited by B l a k S t a r, 02 November 2018 - 10:57 AM. This is almost perfect timing. Two days ago I took apart both of my Edmund mounts that have 1" shafts. I found that they also have plastic bushings in the RA shaft. They were very hard to get back in. Trick was to keep the plastic tight to the shaft while it was slid in. The dec shaft like yours in just metal on metal. I cleaned off the really stick stuff off the plastic and the shaft. I did use a little of some lube in the shaft housing and between the plastic and the shaft. I was surprised at how easily and smoothly the shafts turn now. Edited by Garyth64, 02 November 2018 - 11:30 AM. I would use delrin or nylon bearing material, not Teflon. Why? I already have the Teflon strips made as original, actually I cut a better fit than original. I know Teflon has a local flow that can conform to a contact surface but I don't thing it has large area cold flow. IN other words, I don't think the shaft will settle through the Teflon in long term storage, while the Teflon oozes around to the top side. In addition, the Teflon will be adhered to the shaft. I'm still all ears on the Delrin or nylon. Good point! Yes, there would be an end edge that would be prone to snag and rolling up. I'll look into some coefficients of friction on shim stocks. I just realized I'll have to anchor any shim material in place as there is no groove or other system to retain the shim. 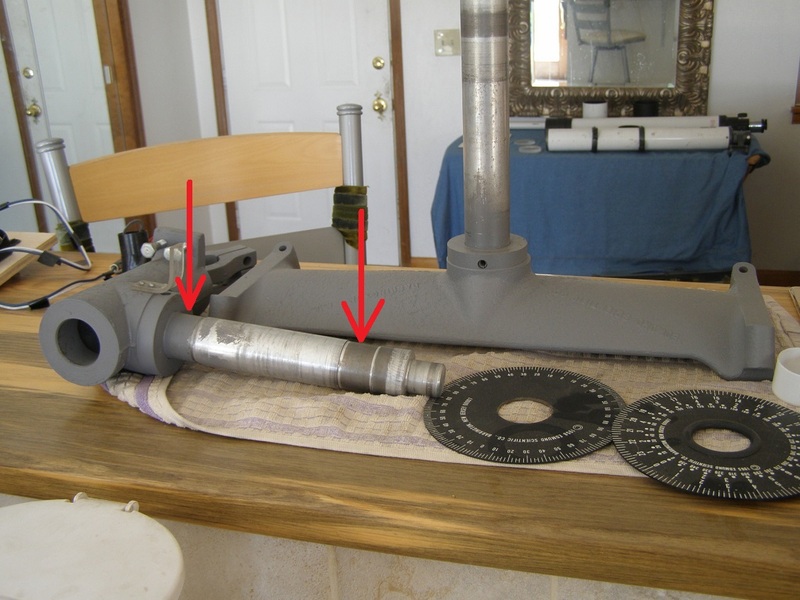 The DEC shaft assembly is the easiest for taking back apart. I'll probably just lube it with Dry Teflon spray which I have on hand, and see how it feels. The $20 spray lube I'm not so sure about. If memory serves CoF for nylon > Teflon > Delrin. Not or sure of Delrin stock forms available these days. Also, brass shim for gap fill on main shaft but I was thinking of an azimuth orientation. As as for the Teflon, can it be effectively bonded and more so why? Either surface can glide without problem so I don't see an advantage. Of course, I don't know all of the design features or characteristics of the mount so I'm just thinking out loud. I completely forgot about my 6" Edmund restoration with the same shaft sets only 1" instead of 1.5". The strips for the RA are also Teflon on the 1" shafts. I installed mine in the regular free floating form with just clean surfaces on the shaft and housing. Smooth as silk. When the strips are installed as free floating, I'm sure they tend to rest with the housing, leaving the shaft to turn on the same area of the strip. It seems they've done OK for the last few decades that way though. One thing Edmund did that was correctly brilliant was to under cut a groove in the shaft where the locking set screw made contact. This lets the shaft be removeable if a burr is created by the locking screw. Strictly a thought experiment on my end. Having the strip adhered to the shaft will allow it to rotate over a changing contact area. Otherwise, the shaft will rotate (and store when not used) on the same spot at all times since the RA housing doesn't move. The strips can be bound fairly easy to the shaft since movement would be transverse to the surface. I've used two sided tape on a test surface. It is easy lift the tape up off the Teflon, not so much to pull it across the surface. In fact, the 3M two sided tape I used didn't care to drag across the Teflon much at all, and it has the perfect thickness to take clearance to zero. I'll use fine and moderate sand paper to lightly abrade across the strips as well. This is going together this weekend. What I have done for the locking set screw was to put in a piece of plastic in the hole first and then put in the screw. There's no wear on the shaft. I have also put in a small ball bearing recently, I don't know how that will work out. I do like the plastic better. Ohhh GAry, Forget the ball bearing, it's the WORST! That is what Criterion used and it's the best way to end up with a valley and ridge in your shaft. Any buffer item needs to be thick enough to stay in place and not rotate off into the housing. Here's how I did the Great Edmund 8" mount to pier interface with such a buffer. 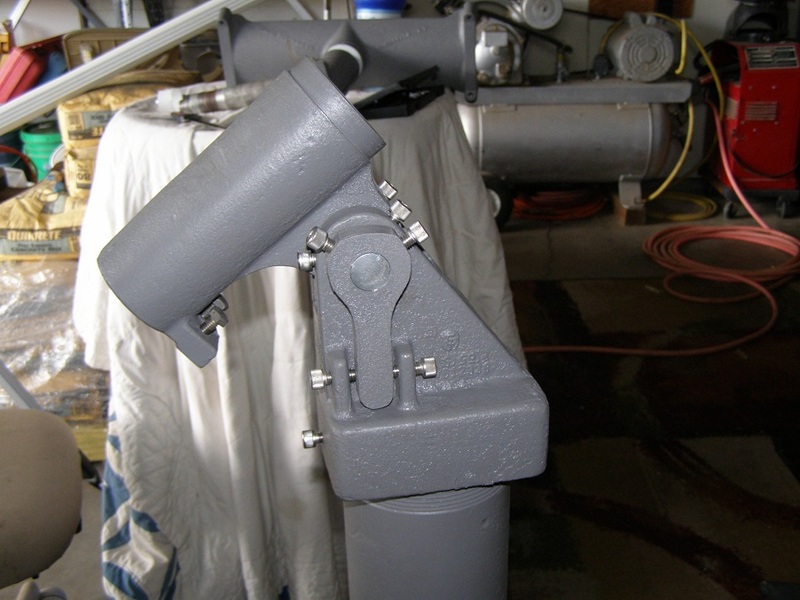 The mount hub is a pipe fitting thread onto the pier pipe. Edmund simply used a set screw to secure this in a barbaric buffoon manner, cramming the set screw into the pipe threads for permanent damage. 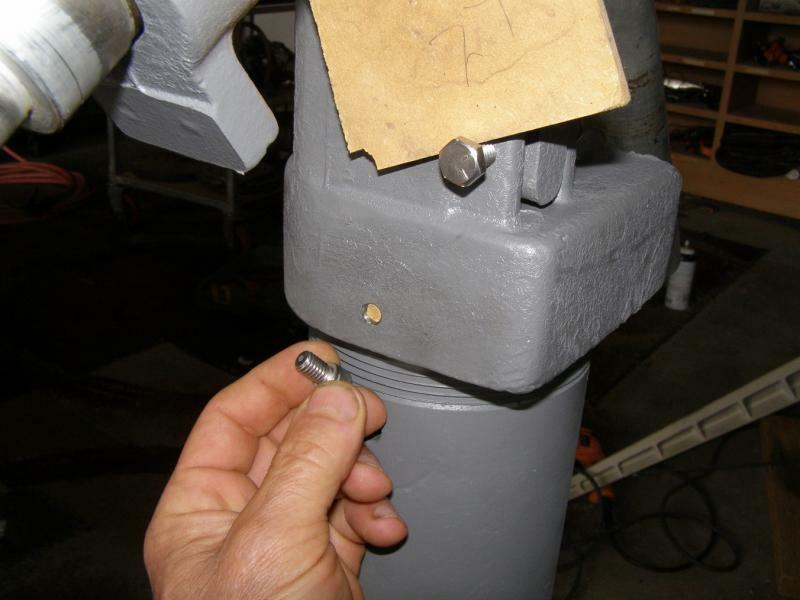 Once the mount is screwed on to a light touch, the clearance becomes Zero between mount and pipe threads. I cut a Masonite plug out of 1/4" thick sheet (shown) and inserted this in the hole. I buffed the end of the stainless set screw replacement (almost always a good idea on almost all shaft items like counterweights too). 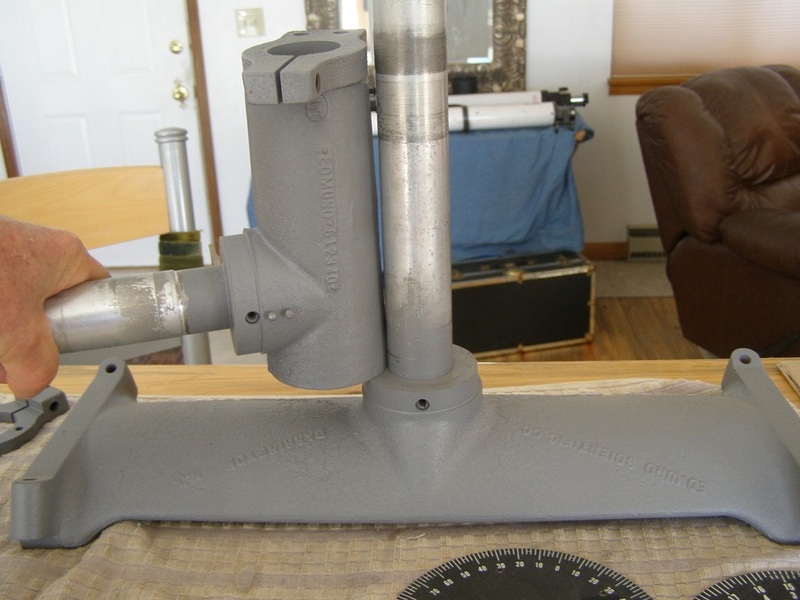 The Masonite plug will ride in the hole for fine azimuth adjustment without sliding off into the threads. The plug will form to the thread, creating an ideal contact. Relative thread positions don't change during rotation. 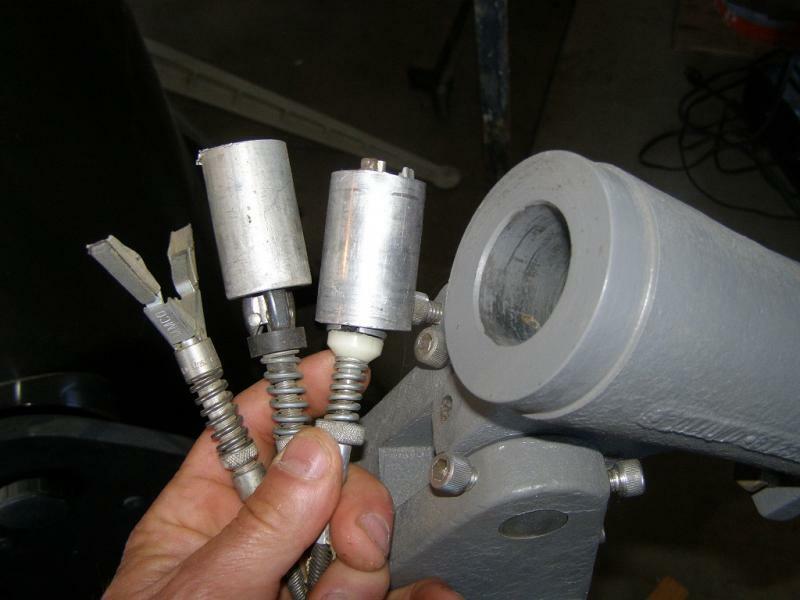 This is how large scale mechanical thread contact sets are done, usually with the plug being an actual threaded piece. In the case of a mount shaft lock, the plug needs to be thick enough to secure into the housing so it won't rotate off into the interior. Get that ball bearing out of there. Here's the mount waiting for the shaft assemblies this weekend. I blueprinted and adjusted all the pins, threads, contacts, shims, etc. These are impressive mounts, correctly designed in general, and worthy of their typical acclaim. Hardware is stainless, and I try to make things look nice. These are vintage classics, and face the facts: unless you hide your scope in a closet, you WILL look at it more than through it. I enjoy both. Get that ball bearing out of there. Thanks. I will take it out asap. I'll go back to a small piece of plastic. I felt that wood would eventually deteriorate, or break. Neil, Where did you find this teflon? Need some. 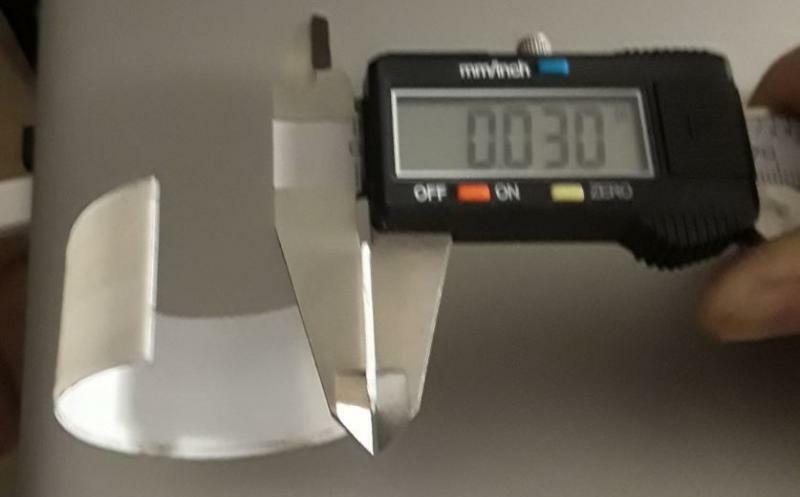 I measure 0.03" thick. Is this correct? I believe that Teflon generally has a lower CoF than Nylon or Delrin..
McMaster Carr is your friend! Don't buy that stuff. Knowing you, it's already ordered yesterday. I have extra, more than enough. My sheet miked at 0.031" I believe, give or take 0.000+"
I used the 3M two sided tape that measured 0.030" but one full wrap around the shaft was too much. The tape is .5" wide so two wraps for width was perfect for the Teflon. I had to take it apart, remove the tape and just use a small section of the tape across the seam in the Teflon. The short tape (perhaps 1/4 perimeter, centered on the seam) gave an excellent slip fit in the housing with no detection of slop. I Q-tipped some Teflon Dry spray lube in the housing bores. I already have extra strips cut. The strips are 1-1/32" wide. I attached them with the seam UP in standard viewing position so the weight then bears on a continuous section. In storage, upside down, the weight bears on the adhesive. I didn't shim the DEC shaft which does have a micro feel of slop. It's trivial for visual, probably never noticed by any one. It may be a factor in precision photography. I would shim with a single piece adhered to the top of the DEC housing in standard position, and shoot for 90 to 120 degrees of perimeter to start. Edited by apfever, 08 March 2019 - 01:49 PM.